The Summer Movie Season is finally upon us, and not a moment too soon. The movie of the weekend is Lucky You... no, wait, let me check my notes here... ah, yes, Spider-Man 3. That makes a lot more sense. The third edition of the most successful comic-book franchise of all time (there's no argument here, right?) is set to launch in a mind-boggling 4,252 theaters starting at midnight, with possible records in sight. 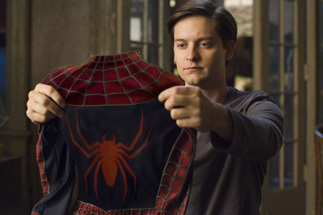 At this point, they could basically just have Tobey Maguire stand in the suit on screen for two hours and open it to $80 million, but thankfully they've provided us with some plot. We're maybe getting a bit of the "too many villains" problem, with Sandman, Venom and a new Green Goblin all showing their faces, but it's also a fairly long movie at just shy of two and a half hours, so there might be room for all of them. The first Spider-Man film shattered records, with the first $100 million weekend (and first $110 million weekend to boot), eventually racking up $403 million domestic. The second movie was a slight step down in both categories, opening to $88 million over July 4th weekend, with $373 million in final receipts. The benchmarks for this edition obviously start there. Reviews are surprisingly shaky, with many criticizing the bloat of the film, as well as what they perceive as melodrama. The Venom story is definitely a fan favorite (albeit a divisive one), and definitely guaranteed to bring the action. In addition to the alien symbiote (which connects with the character of Eddie Brock, played by Topher Grace), Thomas Haden Church (as Sandman) and James Franco (the New Goblin) are on hand to do battle. To counterbalance this, one of Spider-Man's strengths has always been its broad demographic appeal, given the ongoing romance between Peter Parker and Mary Jane Watson. Devoted comic fans also get the addition of Gwen Stacy (played by Bryce Dallas Howard) to add to a romantic triangle, and this will continue to make it a strong performer with both women and men. All of these factors add up to the potential of a record breaking weekend, and although Pirates of the Caribbean: Dead Man's Chest's $135.6 million is in jeopardy, I think it will stay safe following this weekend. There are just enough questions about the quality of this one relative to the first two films to keep it from reaching that mark. But make no mistake, the box office is going to be very, very strong. I look for an opening weekend of $124 million, second all-time.